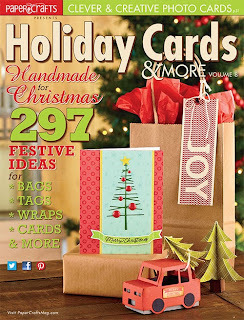 Cath has set a mega Holiday challenge at Moxie Fab World so I thought I'd play along with them. All. I've been trying not to think about making Christmas cards. I mean, why worry now when I can panic later? But Cath's challenge was so inviting. I went with a snowflake theme and blues rather than Christmas trees and red/greens. Mega snowflake foam stamp (magazine freebie), Memory Box Large Parker Numbers, Brilliance Moonlight White, Mei Flower AB crystals, baker's twine, silver ribbon. 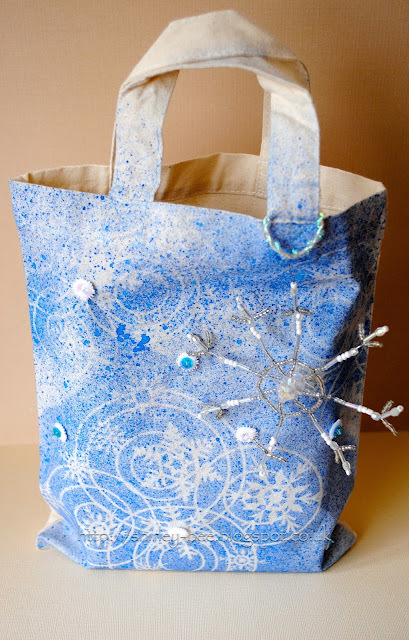 I covered a cotton bag with Mini Winter Wonderland 6x6 Template by The Crafter's Workshop and sprayed blue silk ink through the template (I've had the ink in my stash for years, I'm surprised it still worked). I cut up some lace to get the tiny flowers and stitched them on with sequins and beads. The bead snowflake charm was a gift wrap embellishment from a supermarket a couple of years ago. The bag is just the right size for books or DVDs. In fact, there's a DVD boxed set inside the bag for the photo shoot to keep it upright. The canvas is about 7x5 inches. I used a baby wipe to smear acrylic paints across it then once it was dry, stamped the mega snowflake using Chipped Sapphire Distress Ink. 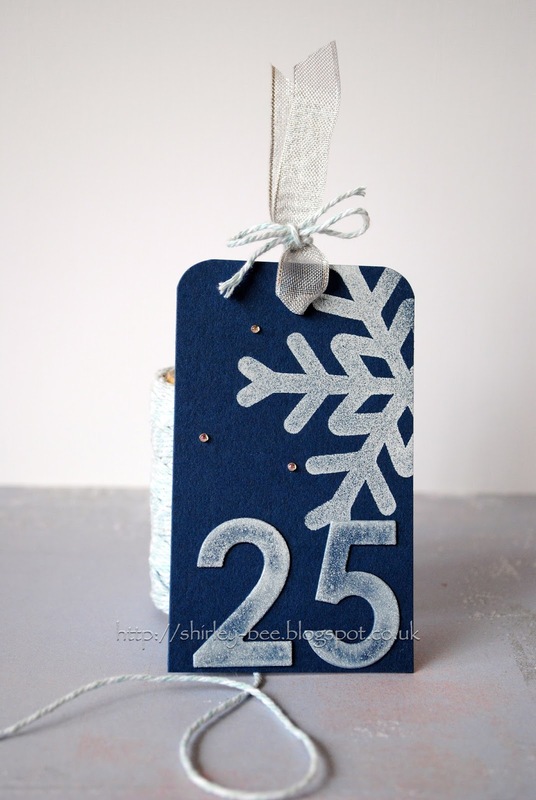 I smeared Chipped Sapphire and Faded Jeans onto a craft mat, spritzed lightly then inked the Stampington & Co C8423 Snowflake Print and stamped it onto spare card, then ripped the edges and stuck it onto the canvas with double-sided tape. Stamped the mega snowflake with Brilliance Moonlight White, glued then stitched it closed. Remember to put the treat in first! So there you have it. And I'm guessing Christmas puddings and selection boxes will be in the supermarkets by next week! OK, I don't want snow yet - but these are so COOL to look at. I love that canvas bag and the fact that you are actually using your mask. I've got to try that. And my fave project of all is the sour-cream-whatever-those things-are-called. Wow Shirley what a creative and inky weekend you've had - love them all. The canvas bag is gorgeous! OMG, you have been a very busy girl! All of your projects are so pretty with all the blue, silver and sparkles! You make me laugh - why worry now when I can panic later! lol! Love all of these - snowflakes are my favourite and you've showcased them beautifully! Way to go! So impressed that you were able to make such wonderful creations for each challenge at Moxie Fab World. Love how they all coordinate, too. the favor and the bag are my faves--nice job! Thanks once again for linking this up to the Holiday Food & Treat Wrap Challenge in the Moxie Fab World, Shirley!! I just loved seeing all your projects for this challenge, Shirley! Thanks so much for joining in on ALL 5!